Here’s another story of an application being rejected by Apple from the App Store. Do you know that? This situation gave me the idea for a funny application that should display the Home screen of your iPhone or iPod touch, but as soon as someone touches it, a scary barking dog should appear. The idea for my little funny “Watchdog” application was born. I developed it, polished it until I liked it much, wrote a description, created a web page etc. and finally submitted my iPhone application to Apple so they can review it and put it into their App Store. On my first submitting attempt the Watchdog application contained real screenshots of the Home screen of the iPhone and the iPod touch in all available languages (blowing up the application size to about 7 MB). I already had the feeling that Apple will reject this because with the screenshots I indirectly use their icon graphics, but nevertheless I tried it. OK, my app really got rejected the first time. Unfortunately, your application, Watchdog Mobile, cannot be added to the App Store because it uses standard iPhone screen images in a non-standard way, potentially resulting in user confusion. Changing the behavior of standard iPhone graphics, actions, and images, or simulating failures of those graphics, actions, or images is a violation of the iPhone Developer Program agreement which requires applications to abide by the Human Interface Guidelines. I can understand that Apple does not want screenshots of the Home screen in apps. The statement is still a bit strange, because Apple complains about “potentially resulting in user confusion”. Er … yes … indeed … Watchdog is designed to confuse (or surprise) the user! When someone uses Watchdog, he does it intentionally and after seeing the barking dog it should be obvious to everyone that there is a kind of … uhm … “watchdog” application running. It’s surprising and can be really shocking if you don’t reckon that (it actually happened to myself a few times) but it’s very funny and you realize the joke at the same second. OK, having screenshots of the Home screen containing Apple icons in an application is really a bad idea. So I added the ability to choose a custom image and wrote a description how the user can make a screenshot of his Home screen. Unfortunately this decreases the ease-of-use of the application a little bit, but it’s not really dramatic. I removed all bundled screenshots and created a funny comic styled “Fake Home screen” that is used as default image. As a side note, the size of the app reduced to around 1.5 MB. I though about what I can use as default image instead. My first idea was to use a cute looking puppy. Perhaps with a sign around its neck saying something like “Replace me” or so. 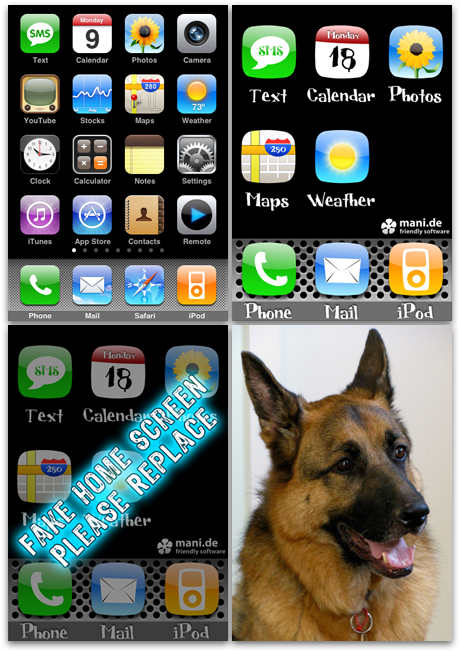 While this might be a bit funny, I did not want to get too far away from the original idea to present a Home screen. So I came up with a modified version of my comic styled Home screen: I dimmed it in brightness and put a very flashy text above it saying that it’s a Fake Home screen. So nobody can ever confuse this with a real Home screen. I was very curious about the reaction from Apple. But – I was already prepared for that – Apple rejected it again. “Simulating failures” is obviously not accepted by Apple. At some degree I understand that, but I thought it’s obvious enough that no-one gets “potentially confused” by this application. Thought wrong. Feel free to purchase Watchdog at the iPhone App Store and tell everybody how cool that thing can be used. 😉 Thank you very much for your support! To get the best effect, you have to create a screenshot of your Home screen. This can be done by quickly pressing and releasing the Sleep/Wake and Home buttons at the same time while the Home screen is displayed. The screenshot ends up in the “Camera Roll” section of the Photo application on the iPhone. Then just choose this image in the Watchdog application. Have fun! This entry was posted on Thursday, March 12th, 2009 at 4:27 pm	and is filed under Development, Fun, General, News, Releases. You can follow any responses to this entry through the RSS 2.0 feed. You can leave a response, or trackback from your own site. I seem to be experiencing the same rejection for my app. The weird thing is that the paid version got accepted but not the free one (which is the same with less themes and no alarm). That’s the app (the free version doesn’t have the c64 theme but it does have the broken LCD screen, which might be the problem (although they refused to explicitely state it). I wonder if you see anything that could be the cause.. I am bit puzzled right now about this.